[153 Pages Report] The aircraft interface device market is projected to grow from USD 115.9 Million in 2016 to USD 230.8 Million by 2021, at a CAGR of 14.76% during the forecast period. The base year considered for the study is 2015, and the forecast period is from 2016 to 2021. 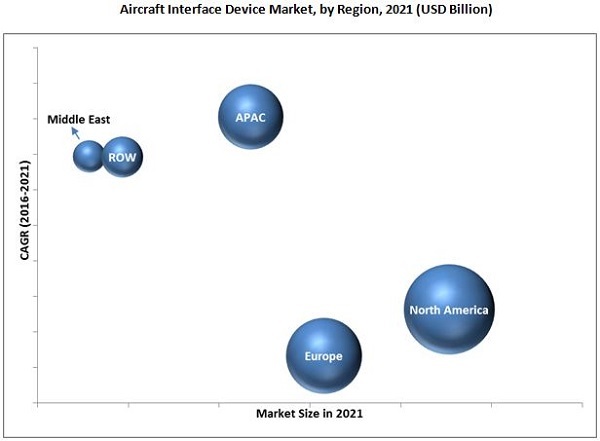 The report analyzes the aircraft interface device market on the basis of aircraft type (narrow body aircraft, wide body aircraft, very large aircraft, regional transport aircraft, business jet, rotary wing aircraft, fighter jet), connectivity (wired, wireless), end user (civil, military), and fit (linefit, retrofit). These segments and subsegments are mapped across major regions, namely, North America, Europe, Asia-Pacific, Middle East, and rest of the world (RoW). The report provides an in-depth market intelligence regarding market dynamics and major factors, such as drivers, restraints, opportunities, and industry-specific challenges influencing the growth of the market, along with an analysis of micromarkets with respect to individual growth trends, future prospects, and their contribution made to the overall market. The report also covers competitive developments, such as long-term contracts, new product launches & agreements, and research & development activities in the aircraft interface device market. The market size estimation for various segments and subsegments of the aircraft interface device market was arrived at by referring to varied secondary sources, such as OMICS International, European Defence Agency, market outlook and corroboration with primaries, and further market triangulation with the help of statistical techniques using econometric tools. All percentage shares, splits, and breakdowns were determined using secondary sources and verified through primary sources. All possible parameters that affect the market have been accounted for, viewed in extensive detail, verified through primary research, and analyzed to acquire the final quantitative and qualitative data. This data is consolidated with detailed inputs and analysis from MarketsandMarkets, and presented in this report. The ecosystem of the aircraft interface device market comprises raw material suppliers, manufacturers, distributors, and end users. Some of the key market players operating in the market include United Technologies Corporation (U.S.), Rockwell Collins, Inc. (U.S.), Teledyne Control (U.S.), Esterline Technologies Corporation (U.S.), Astronics Corporation (U.S.), navAero Inc. (Sweden), Arconics (Ireland), among others. These players have adopted strategies such as contracts, new product developments, and agreements to strengthen their position in the market.